Megan Abbott's books are a particular delight and when I found out she had written a book set in the world of competitive gymnastics, it became my most anticipated book of the year. Abbott writes girls in a way that I love all heart and claws and insecurities and big feelings and possessiveness, etc....that made me think this setting was really going to sing. Well it turns out the book was not written from the teen girl perspective, but rather the mother's but it didn't matter a bit, I loved this book. Katie Knox's daughter is an especially talented gymnast who came by gymnastics after an accident in toddlerhood left her with a need to do something to work on balance. But more than just an added part of her life, gymnastics became her life with her talent and her parents soon found themselves sacrificing everything to further the ultimate Olympic dream. Devon's ambitions become the family's ambitions. Until someone close to their gym is killed and Katie is left wondering what exactly happened and just how far they are all willing to go. As with all Abbott's books, this book is compulsive reading at its best. I didn't mind at all giving over an afternoon to tearing through the pages. I completely believed the world in the pages and was curious to see what actually happened. 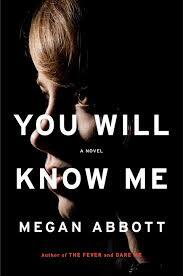 And once again, I just fully enjoyed Abbott's girls and the complicated tangled relationships between women. There's a lot to think about in regards to parenting in this book...it is hard to understand the families who give over their lives for elite athletics and we'll soon be thinking of those same things again as the Olympics start. Is it worth it? How does it affect the other children? etc. But there's also much to consider about memory, the stories we tell ourselves about ourselves and the ones we love, the power of self-deception, ambition, and more. You Will Know Me is a book I recommend to mystery lovers and those who are also interested in entertaining these ideas as they watch the Olympics. But really, like all good books, it's a book I recommend to all. I received an ARC which was a total surprise and completely made my day.